The initial part of the Speed survey has been completed by the Police on the roads 26th Oct – 2nd Nov.
Croughton Rd (Near Cartwright Gardens) volume traffic 68708 (compared to 71282 in Jan 2016), average speed 32mph. Banbury Rd (Near College Fields) volume 54806 (no date to compare), average speed 36mph. 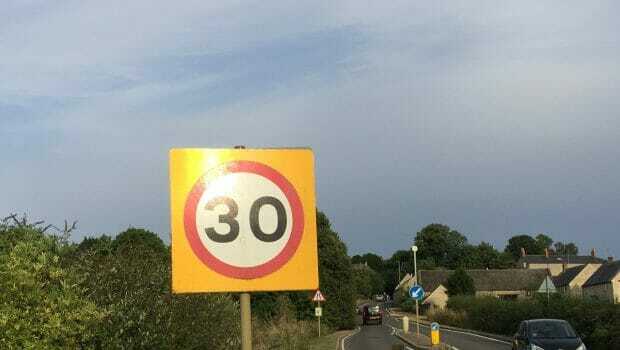 Road safety in and around our village is important and both the Police and Northamptonshire Highways are considering proposals including a reduced speed limit around Aynho Wharf and the use of mobile speed camera vans. Our mobile interactive speed sign will be rotating locations in the village soon to bring awareness of road users of their speed and collect useful data that we can share on here. Aynho Parish Council have requested speed camera vans to be considered in and around the village, the locations and criteria are specific and Matthew O’Connell has sent us this email explaining. We will update this post when further information is available. Many thanks for your email, I will add this location to our current request list for analysis and potential enforcement. As part of this process I have asked for a speed data survey to be undertaken. A small device will be mounted to existing street furniture as close to the identified area as deemed suitable by our Technician. The device is a radar based unit and will record all vehicle movements during its deployment, usually around 7 days. Each vehicle movement will provide a date and time, speed, direction of travel, rough idea of length and the gap to the vehicle in front (to identify standing traffic). From this data we will calculate the 85th percentile speed. The 85th percentile is a nationally used figure to identify the speed at which most careful and competent motorists are travelling at or below. This figure gives an understanding of the speed most drivers consider suitable for the look and feel of the environment. There are a number of criteria which we need to satisfy before setting up a mobile enforcement location. The first stage of which is, following a period of data collection, identify an 85th percentile speed above the NPCC (previously ACPO) enforcement threshold guidance of 10%+2mph. The next stage would be a full suitability assessment, to identify a safe and suitable location for enforcement, ensuring relevant health and safety is observed. Assuming a location can be identified, further checks will then be carried out to verify all of the required signage, and traffic regulation orders where required are up to the legal standard. Assuming no issues are identified then the site will be set up and enforced on an ad hoc basis. To manage your expectations, I expect to have the results of the speed data within the next 6-10 weeks and can provide you with an update at that time as to what action we plan to take. As mentioned above there are a number of criteria which we need to satisfy, and there is a possibility that the outcome may not be what you would have hoped for.